Pixels: smaller than the point of a needle, able to be nearly 200,000 different colors, and something you stare at basically all day. Pixels are everywhere, from your TV screen to the screen on your smartphone, and even the print on the business cards in your wallet. Each one of these displays is created through rows and columns of pixels. In each traditional pixel, there are three separate color values: Red, Blue, and Green (also known as RGB). These pixels are used in digital media, including websites, the images on your smartphone, etc. For print, pixels generally use the Cyan, Magenta, Yellow, and Black color model (CMYK). Each of these pixel values depends on the device you're using—whether it's the classic Atari and 8-bit style games, or something more modern, like your TV, which runs between 24 and 60-bits. 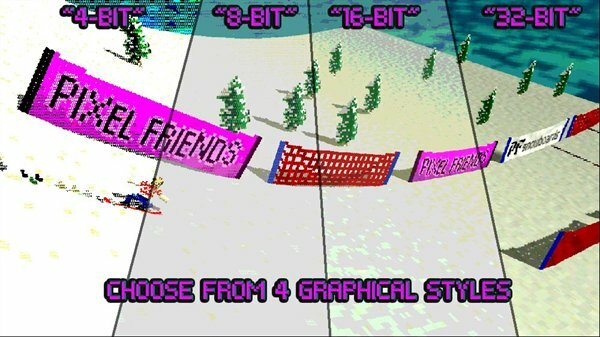 A comparison image showing the difference between 4, 8, 16, and 32 bit. When working with different bit values, the color possibilities expand exponentially. For example, when working with RGB in 16-bits, there are 65,536 tonal values for each color. To compare, RGB in 24-bits allow for up to 16,777,216 different tonal values, allowing for nearly endless possibilities. The biggest problem with pixels and digitization of multimedia is with upscaling: how do we put an 8-bit image on a 32-bit screen without seeing pixelation. Pixelation, simply put, is when you can visibly see the pixels as squares of color that make up the image, rather than a seamless image. The most common way of tackling this problem is described through the Infinite Pixel Rule. This rule basically states that as we increase in screen resolution, we're (infinitely) dividing the pixels in half to achieve said resolution. This helps to keep images smooth and gets us to achieving our required Pixel Per Inch (PPI) measurement. PPI measures pixel density, with the majority of screens boasting 100 PPI. For example: a 24 inch screen with a 1920 x 1080 resolution (or a 1080p screen) would have values of wp = 1920, hp = 1080, dj = 24, giving us a PPI of around 92. Similar to PPI, when doing print material the metric we use is called Dots Per Inch (DPI). Most print work requires a minimum of 250 DPI, with an optimal value being around 300 DPI. Any design that can be viewed in short distances (business banners, flyers, business cards) requires 250+ DPI, or pixelation is going to happen. If you're printing something like a billboard, or other large media meant to be viewed from far away, you can get away with a much lower DPI (sometimes as low as 72 DPI). Pixel size is determined by the screen's resolution. As was mentioned before, the resolution comes as a pair of numbers indicating the screen's width and height in pixels, which can be as small as 280x420 (older smartphones) and up to (currently) 7680x4320 (8K televisions). It would be easy if everyone just used these ratios, but why would anything be made easy? You've probably seen it before, someone referring to their screen as 2K/4K/8K, or even as 720p/1080p/1440p. These are all actually pixel measurements, just disguised because they're only telling you one value. The "K"s are referring to horizontal pixels, or width (2k = 2048, 4k = 3840, 8k = 7680), while the "P"s are referring to vertical pixels, or height (720p = 720, 1080p = 1080, 1440p = 1440). Then, to further confuse the concept, we've also got WUXGA (Widescreen Ultra Extended Graphics Array) and UHD (Ultra-High Definition). WUXGA is the equivalent of 1920p, while UHD is the equivalent of 3840p. Aspect Ratio is another measurement for your screen. An aspect ratio is the proportions of the width in relation to the height, and it is denoted by a pair of values X:Y, where X is the vertical length and Y is the horizontal length. Back when we had CRT, or Box TVs, the aspect ratio was 4:3. 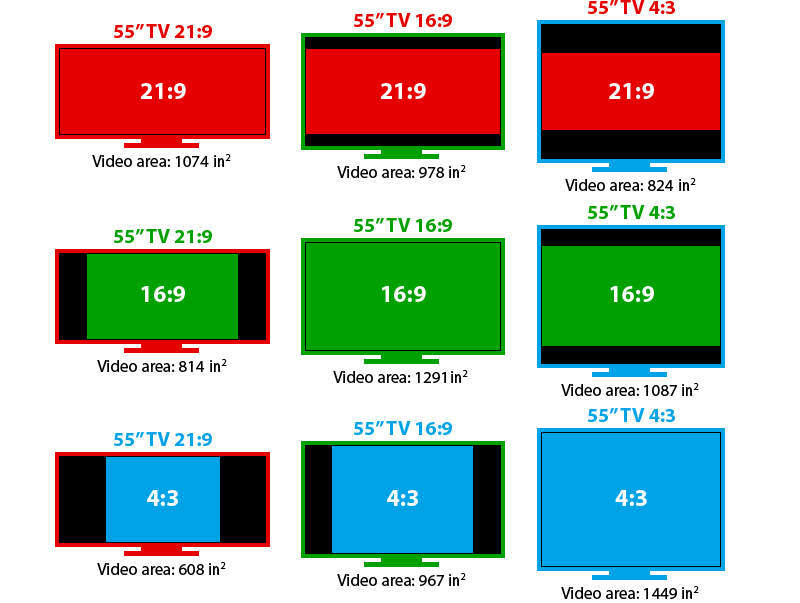 Now, the standard of HDTVs is 16:9. You get 21:9 when you go to a normal movie theater. If you go to the IMAX, you’ll probably see your movie at 19:10. The aspect ratio is responsible for those black bars that appear on the bottom or side of your video. If your video is not wide enough, then you’ll get vertical black bars, which is called pillarboxing. Conversely, if your video is not tall enough, then you get horizontal black bars, which is called letterboxing. Several common aspect ratios and how letter/pillar-boxing looks. Unfortunately, pixel technology is not perfect. Occasionally, you'll come across a stuck or dead pixel, one of which usually fixes itself after a power cycle or just with time. Stuck pixels are pixels that don't refresh with the others, and therefore the color is off. Any of the three color registers (RGB) can be stuck on, causing one pixel to look severely out of place. When it comes to dead pixels, you'll see a black pixel on the screen that never adopts a color. Dead pixels are nearly impossible to repair and, depending on where the pixel is, can lead to users feeling as if they need to replace their screen. 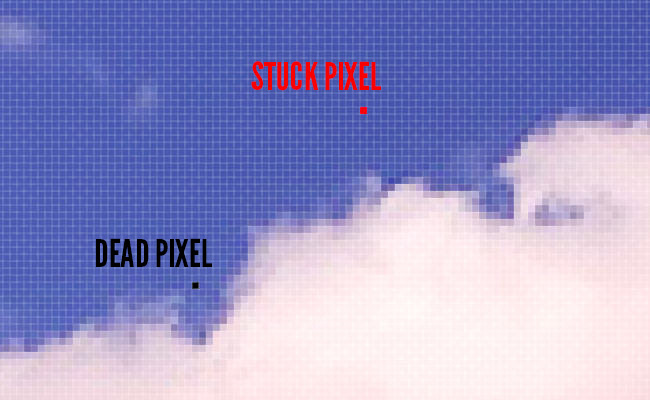 The difference between a dead and stuck pixel. We live in a world where pixels dominate basically every moment of our lives. Whether you're surfing the web, browsing Facebook on your mobile device, or looking at the business card a salesman just handed you, you can be sure that pixels are what created that media. Do you have questions on pixels, or how they work? Would you like to see how Armor Techs uses pixels to create functional art, in the form of websites or print material? Stop by the shop and talk to the Techs, and we'll be sure to get you some information and help you use pixels for the benefit of your business, products, or services!